The ultimate agent gets another game with mixed results. Unfortunately, the results are more towards the low end of the results pool. An international incident can well put a bio-chemical project into the wrong hands. It is up to Her Majesty’s Secret Service number one man, James Bond to unravel the mystery, identify the players and stop the plot. All in the promise of some of that over the top mind blowing James Bond action so many fans love. This third person action shooter being a Bond game heads off in true Bond fashion on a globe encompassing adventure. The action takes place on land, sea and air and goes to remarkably cool locations such as Istanbul, Bangkok, and Athens. It has all the makings of a great Bond adventure, the formula is in place including the opening teaser and spectacular boat chase with explosions and gunfire. The game has so much potential and has some Bond moments but for some reason things just do not seem to mesh. Unpolished smacks the player in the face from the cut scenes that seem to have a problem in the voice to lip sync part. It is not a bad game, it is just that it never really plumbs the depths of being an in depth game. Developer Bizarre Creations and publisher Activition bring us a third person Bond adventure that makes use of a cover system during gun battles, as well as a kind of focus shot ability that feels a bit out of place for some reason. It is of course our hero Bond, blocking out all distraction and shooting with pinpoint accuracy at his target. 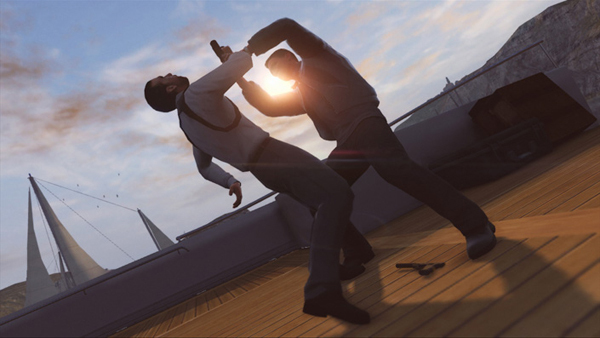 In addition, a rather impressive hand-to-hand combat system that flows seamlessly from gun battle to hand-to-hand mayhem, often brutal and to the point if there is any more Bond adventures the designers would do well to keep this system. 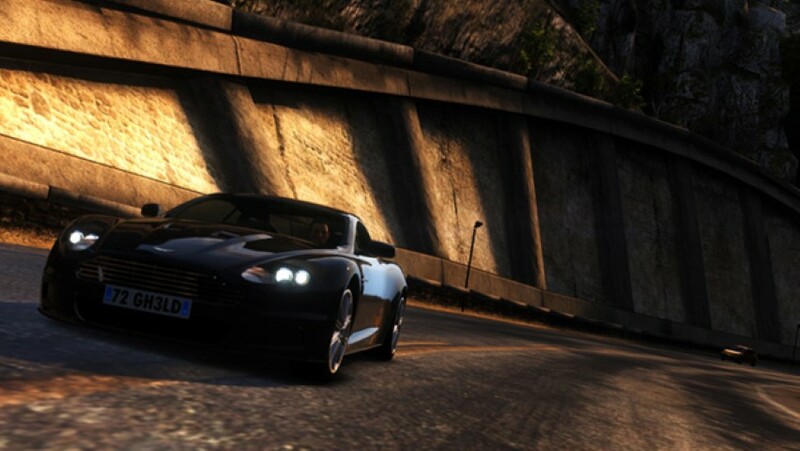 Vehicle Chases are nail biting high-speed action with plenty of crashes and explosions. There are times that the action is so fraught with elements of explosion and debris that it can be hard to see where you are going or intended to go. The danger is high and drop offs over cliffs or into the water is unforgiving and will force the player to repeat the start of the chase sequence all over again. There where plenty of times that frustration mounted and I almost did not want to bother seeing the game through, after all, who needs the frustration? Action, adventure and some challenge yes, but no hint of what you are doing wrong. The vehicle physics at times caused a spin out and a mad rush to drive backwards and spin the car around again. This maneuvering is highly satisfying, but often in the chase, time is of the essence, loose site for too long and the level starts over stating that they got away. Over all the car chases are some of the best parts of the game. Gee, wiz world of Bond Gadgets, again thankfully the designers did not put things too over the top into fantasy sci fi. A kind of smart phone can pin point enemies around you, and assist in knowing what direction to go. This gaming aid actually is a welcome thing. The designers placed it firmly within the James Bond universe and there for it is not intrusive and does not wrench a player from the game. It feels like it belongs. Thankfully, the game cuts from the cloth of the rebooted Bond, the grittier closer to Ian Flemings’ no nonsense man of action. Once again, like the rebooted film using the likeness of Daniel Craig. Therefore, there is plenty of action and none of the campiness that started to plague bond back in the 80’s. The hand-to-hand takedowns are brutal. The mad action of some levels keeps the adrenalin up just enough with the hints of pending danger and death to make it an endearing romp in the world of a James Bond adventure. The movements remind me so much of the latest Bond films and with good reason. 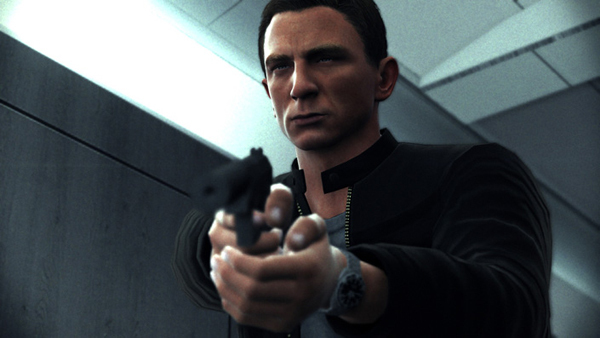 The game creators got Ben Cooke, who is Daniel Craig's stunt double in the films, to provide the motion capture for Bond’s digital animations. The multiplayer battles are the standard faire and do not inspire… one of those, oh I have to play this multiplayer. Though like most multiplayer games if you can manage to get a team that actually works together, strategy and goals are more fun in the end. It is up to 16 player multiplayer madness with spies vs. mercenaries. Single player is incredibly short; for what it’s worth, it is not a bad ride. The end of the game does leave a lot open and hints at the continuing of the story. It would be indeed a shame to leave things hanging. Here is hoping Bond will return, and with a bit more levels, with just a hint more polish to some of the presentation, graphics and voice to cut scene synchronization… we may well have a complete package. No Mr. Bond, we do not want you to talk, we want more levels. We hope to see Bond Return to complete the story because it is clear it is not finished. 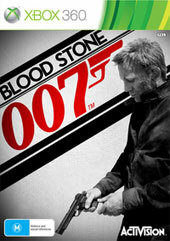 Bloodstone: 007 will draw more of the James Bond fans. Gamers looking for something different may not be as impressed, though those that give the game a chance may well find a game sprinkled with a few gaming relished moments, far and between as they are.